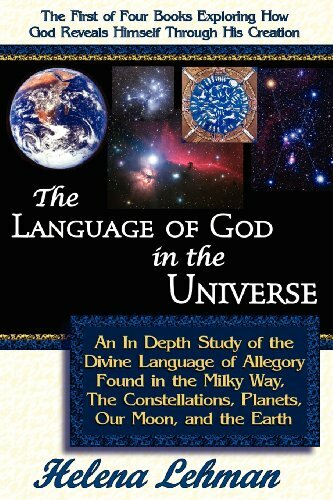 This is the 16th Edition of Book One in the Language of God Book Series : "The Language of God in the Universe - An In Depth Study of the Divine Language of Allegory Found in the Milky Way, the Constellations, Planets, our Moon, and the Earth", ISBN: 0-9759131-0-7. Like its predecessors, this newly revised edition takes a profound new look at Sacred Astronomy, the Gospel in the Stars, and their connection to the Bible. By understanding the allegorical Language that God utilizes to communicate to mankind, and applying it to the Zodiac and the Bible, both are shown to be filled with similar prophetic imagery. Many allegorical ties between the Bible, and the Gospel in the Stars are revealed, and once mysterious prophetic Scriptures suddenly make sense. The Universe, and the forty-eight constellations of the ancient Zodiac are like biblical parables on a giant scale. They tell a compelling story that fully agrees with the Bible, and the unfolding of biblical history. The Magi who found Christ likely knew this, and the book examines their possible use of Sacred Astronomy to locate His whereabouts in Bethlehem in 3 BC. Secondly, the parable-like allegories found in our Solar System, upon the Earth, and in various elements of nature are explored. By seeking the Language of God apparent in every created thing, each layer of Yah's creation can reveal startling truths about our Creator, His love of mankind, and His desire to save us from our worst enemies: Satan and our fallen nature. This 6" X 9" Paperback is 430 pages long, with 60 B & W illustrations printed on quality white paper, an extensive bibliography, and full index. If you have any questions about this product by Pillar of Enoch Ministry, contact us by completing and submitting the form below. If you are looking for a specif part number, please include it with your message.